The choice between Chrome, Firefox and Safari just got a little tougher. A new OS-X-exclusive browser dubbed Raven takes the world of apps and brings them to the Web without sacrificing the style and simplicity the Apple operating system is known for. Given that Raven was designed specifically for the Mac operating system, it should come as no surprise that its user interface bears a striking resemblance to all things Mac. You have your dock (albeit it to the left hand side) in a black panel, and this houses your applications. The overall design is minimalistic and stylish. To navigate raven, you can choose to use the browser’s apps, or take the traditional route via the Web in its basic form. 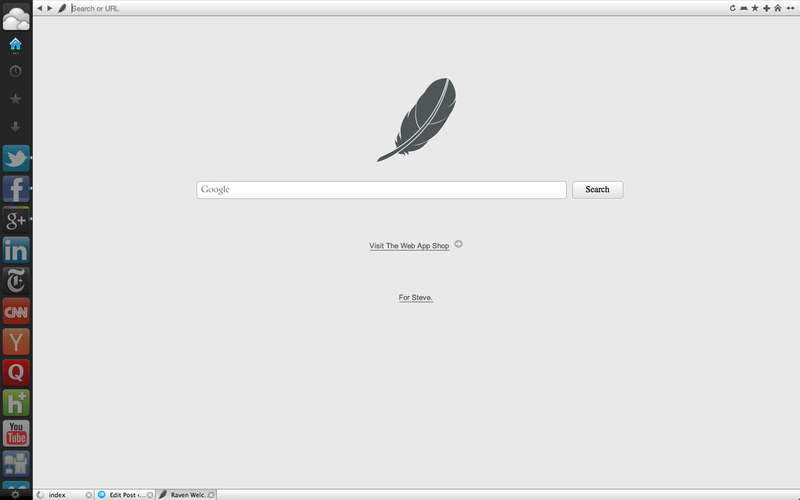 The omnibox is a sparse strip across the top of the page, which strangely houses Raven’s navigation tools. 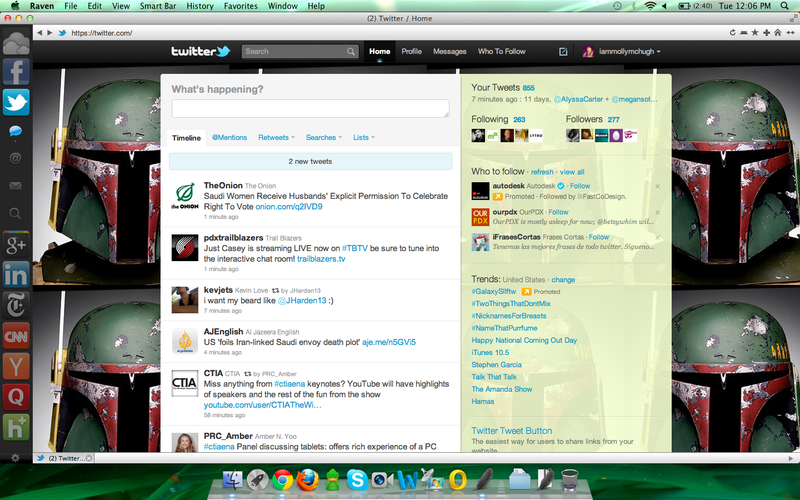 On the right hand side, you can find the tools to refresh, add a tab, star, bookmark, or return to the home page. All pretty standard fare. You also have the option to turn your entire screen over to Raven, and given this browser’s focus on apps and appearance, we can see how it wants to be the destination for much of your activity. Give it a strengthened app store with more production-oriented tools, and lightweight work could definitely be accomplished within Raven. Being in beta means that there isn’t a terribly large inventory of apps to play with, but Raven does a admirable job bringing users some key choices. The default applications of choice like Facebook, Twitter, CNN, the New York Times, Delicious, YouTube, and Flickr are all there, as are noteworthy additions like Vimeo, Hulu Plus, and Quora. 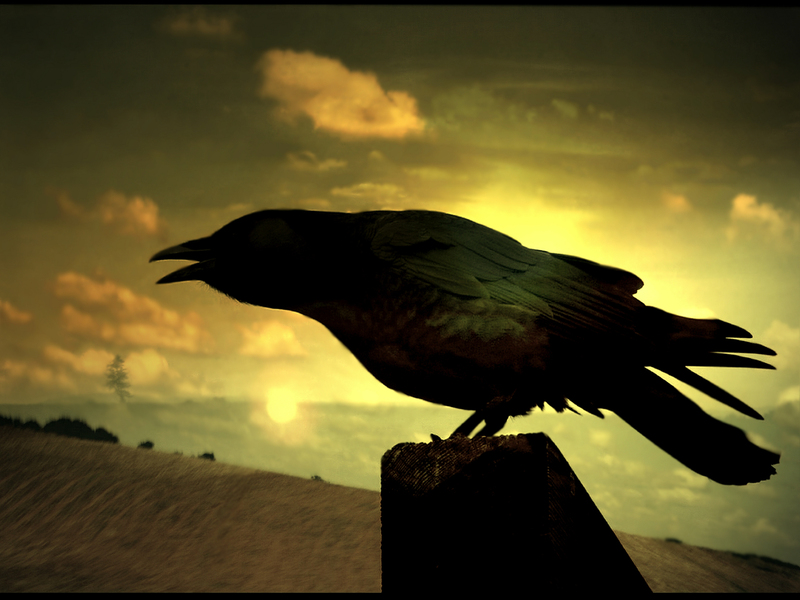 Raven takes on a desktop-like attitude, particularly with the social applications and those that require or cater to user interaction. Ubuntu and Apple users will appreciate the seamless experience of moving between installed software and the Web. The left-hand side panel holds all of your chosen apps, as well as navigation icons. 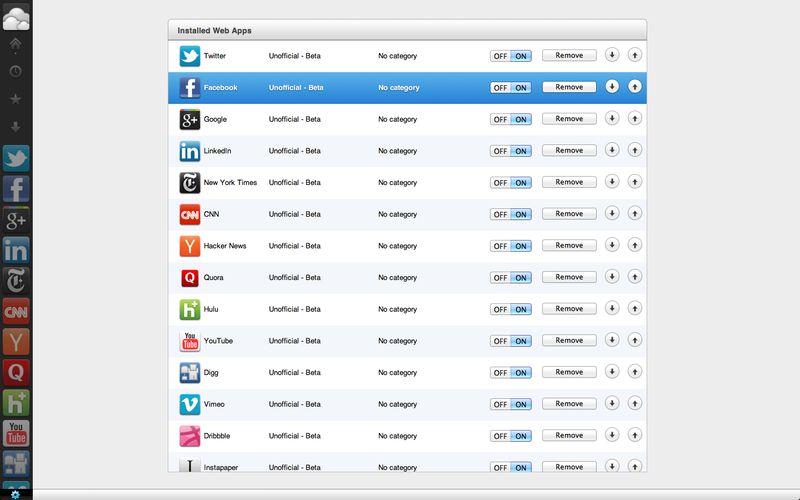 Selecting an app then brings up your options for in-site actions. For example, opening Twitter via the Raven app pulls up your command options for the site on that left-hand panel, placing them below the Twitter icon. Users can refer almost entirely to the left-hand panel once they’re inside an application. Apps like CNN pull up video or breaking news options (CNN specifically has its iReport feature installed). So while your instinct might be to use CNN’s default navigations, there are benefits for more consumption-based Websites as well. Generally, working with Raven is a pleasure. It’s stupid-simple to orient yourself with all of the navigation commands, and installing and using apps is quick and easy. 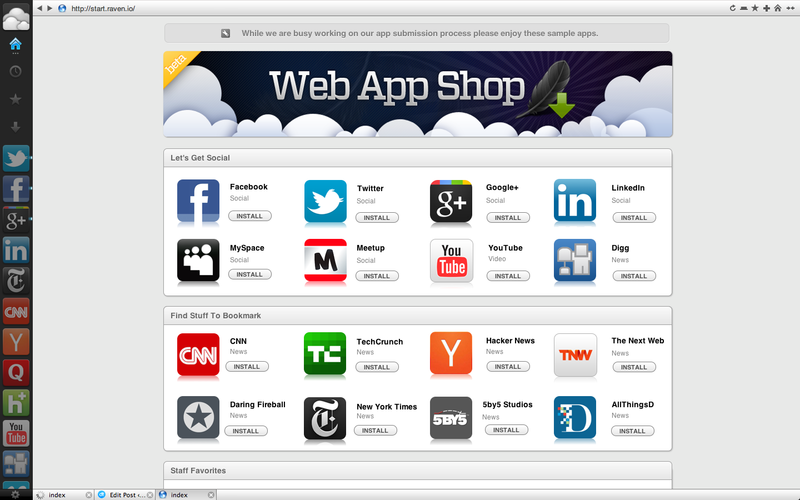 Switching between apps and the native Web was seamless, an upgrade from Chrome’s Web Store experience in our opinion. There was less of a “marketplace” feel to installing apps, and they were deposited into the sidebar automatically instead of via a dedicated page. It’s a small difference, indistinct to some, but Web apps themselves are some sort of compromise between bookmarks and desktop software, and this felt like a more natural choice. The app organization could bear an upgrade, however. We’d love it if Raven would offer infinite scrolling for the left-hand sidebar so you can automatically paw through your apps instead of selecting the gear icon at the bottom to determine if they get to sit in one of the 12 coveted spots. Either that, or shrinking icon size based on how many you install, so you can view them all at once. As it stands, you can manually indicate your apps status by pressing the gear in the bottom left-hand corner. Our only major complaint is that we wish Raven weren’t a Mac-specific browser. It’s not as fast as browser dominators like Chrome and Firefox, but we like how it toes the line between app-dependent and Web-enabled. Raven has its early kinks to work out, but given the thinning line between the Web and the desktop, this is a visually interesting and intuitive solution to closing that gap a little more.